Overall food security situation of the district is minimally food insecure during this reporting period (16 Mar.- 15 Jul.'15). Out of total 41 VDCs all 10 VDC of cluster A, 20 VDCs of cluster B and 11 VDCs of cluster C are in phase 1 whereas outlook (16 Jul.- 15 Nov.'15) of the district will remain same although there will be seasonal deterioration in food security situation during Shrawan-Bhadra (i.e. Jul.-Aug.). Overall food security situation of the district is minimally food insecure during this reporting period 16 Mar. 2015 to 15 Jul. 2015). Out of total 62 VDCs and 1 municipality all are in phase 1 whereas outlook (16 Jul.2015 to 15 Nov. 2015) of the district will remain same although there will be seasonal deterioration in food security situation during Shrawan-Bhadra (i.e. Jul.-Aug). As per DFSN meeting, the district is Minimally Food Insecure and more than 80% households are able to access and consume food without shifting their livelihood strategies. Minimal food Insecure is attributed to the previous food stock, access to market purchases, harvesting of Paddy, Maize, good income from wage opportunities in construction and agriculture activities as well as sell of cash crops/NTFPs (vegetables, potato) .Market price of main commodities (rice, wheat flour) has increased by 8-12% compared to the base year over the district. However, price is stable compared to the last cycle but increased marginally compared to the price of this season last year. 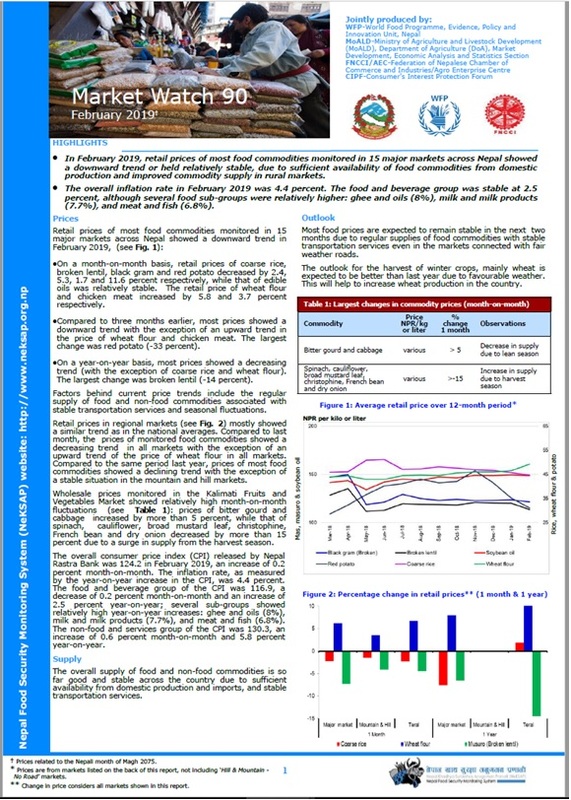 The DFSN classified Dhading as minimally food insecure (Phase 1) in this period. Nevertheless, as shown in the phase classification map, some wards in 12 southern VDCs (cluster E) were reported as moderately food insecure (Phase 2). Overall, the district was classified as minimally food insecure during the period of mid July to mid November 2013. 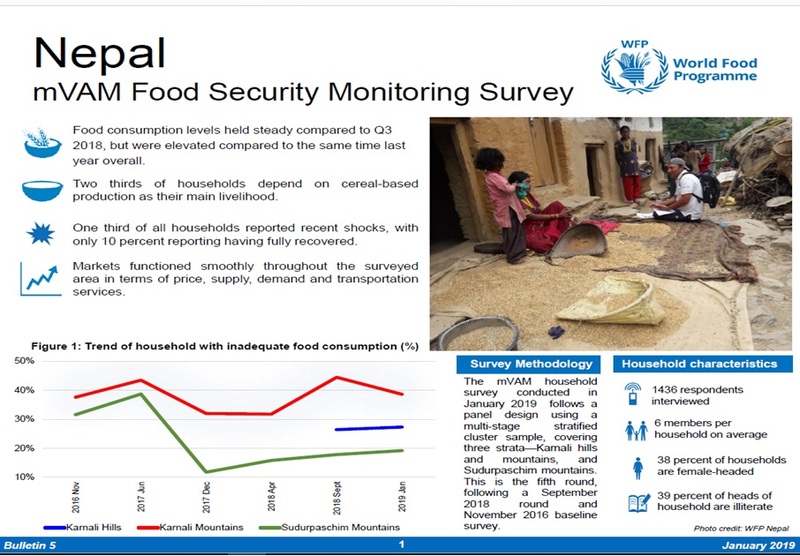 * Current situation reflects an exceptional deterioration in the food security situation as compared to the last cycle (January- March 2013) and same cycle last year (April- June 2012). The swollen Mahakali River displaced some 3, 500 people, swept away 13 government offices including the District Health Post, damaged roads, bridges, and other infrastructure (including 185 private houses), and disrupted the supply of food.